The Lectionary's second reading for this week is Matthew 21:1-11. It is one of my favorite passages because it features a rarely-seen version of Jesus, Circus Jesus. Matthew 21:5-7: "Tell the daughter of Zion, Look, your king is coming to you, humble, and mounted on a donkey, and on a colt, the foal of a donkey." The disciples went and did as Jesus had directed them; the brought the donkey and the colt, and put their cloaks on them, and he sat on them. Unlike the parallel texts in Mark 11:1-10 and Luke 19:28-38, Matthew apparently didn't understand the Hebrew parallelism in the original text. Only a single animal was meant. A clear example of this can be seen in Genesis 49:11. 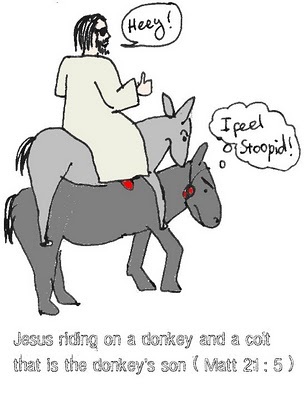 Moreover, Matthew apparently didn't realize the lunacy of saying that Jesus rode both a donkey and a colt simultaneously; he was too concerned with making sure his version of the Jesus story had Jesus fulfilling every single prophecy exactly, because, after all, for Matthew, more so than for any other gospel writer, Jesus is the Jewish messiah, meaning that he had to fulfill all of the Jewish prophecies, even the ones Matthew made up.